What better way to enjoy a family night at home. You can use either a portable gas burner, single electric burner or even a crock pot. Many of our local supermarkets now sell shabu shabu style thinly sliced meats making it easier for you. A fun, feel good and nutritional meal all in one! 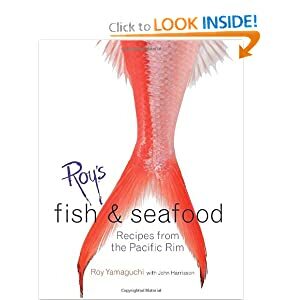 Order Chef Roy's Fish & Seafood Cookbook - Owner of the critically acclaimed Roy’s restaurants, public television host and celebrated chef Roy Yamaguchi is considered one of today’s greatest seafood chefs and has been credited with reinventing Hawaiian cuisine. *If slicing the meat yourself, place in freezer until slightly frozen before slicing. In a small mixing bowl; combine sauce ingredients. Divide into small dishes. Onto separate serving platters; decoratively arrange beef on one platter. Top with lemon wedges. On second platter; decoratively arrange vegetables, tofu and noodles. In a large shallow saucepan over medium heat; combine dashi or broth and water. Bring to a simmer. Add desired items to saucepan until cooked to desired doneness. Serve with dipping sauce. Serves 3-4.